There is no evidence to support use of burdock to treat cancer, infections, diabetes, or other medical conditions. Certain components of burdock were shown to stop the growth of bacteria and fungi in lab studies. In animal experiments, the root extract lowered blood sugar, stimulated uterine contractions, induced an immune response, and protected against DNA mutations. A clinical study found that application of a cream containing burdock extract improved the appearance of wrinkled skin. There is no scientific evidence to support this use. One small study found that burdock reduced proteinuria and improved post-meal blood glucose levels and lipid metabolism in patients with diabetic nephropathy. This claim is not backed by scientific data. Although certain compounds in burdock can stop the growth of bacteria and fungi in lab studies, human data are lacking. One clinical study found that application of a cream containing burdock extract improved the appearance of wrinkled skin. However, more studies are needed to confirm this effect. Some burdock teas are contaminated with alkaloids such as atropine from the belladonna plant, which can cause undesirable effects on the nervous system. You are pregnant (Burdock may stimulate the uterus and increase the risk of premature delivery). Case Report: A 53-year-old man developed anaphylaxis (redness over his entire body and dyspnea) one hour after taking boiled burdock. His symptoms resolved following treatment. Burdock is one of the ingredients in the herbal tea Essiac. 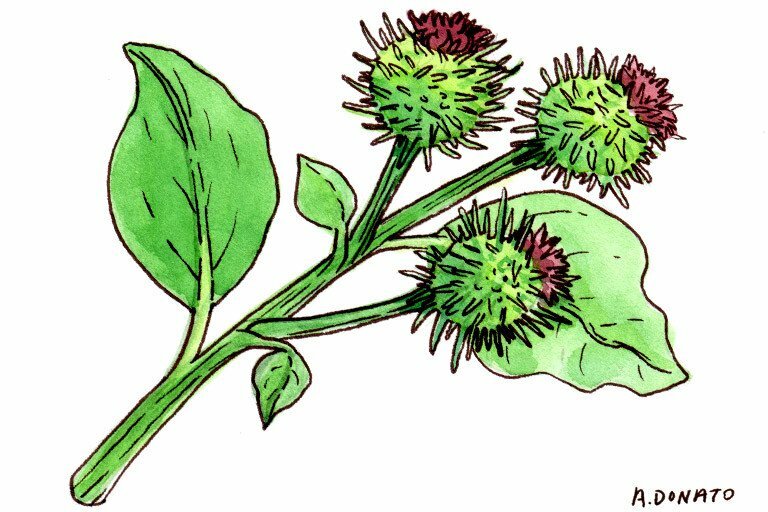 Burdock, a perennial plant native to Europe and Northern Asia, is now found worldwide. The root has been consumed as food in Asia for many centuries. The fruit is valued in traditional Chinese medicine as a blood purifier, a cure for sore throat and colds, and as a topical remedy for skin disorders including acne, eczema and psoriasis. It is also used to treat anorexia, gout, cancer and HIV, although no published clinical studies have evaluated these claims. Preclinical data indicate that burdock has anti-inflammatory (1), antibacterial (11), antiulcerogenic (12), hepatoprotective (6), antidiabetic (13) and anticancer (14) effects. A clinical study found that topical application of a formulation containing burdock extract significantly improved dermal extracellular matrix metabolism and visibly reduced wrinkles (4). A mixture of burdock fruit and astragalus root reduced urinary protein and albumin, and improved lipid metabolism and post-prandial blood glucose in patients with diabetic nephropathy (5). A preparation of burdock tea was found contaminated with atropine, an alkaloid (7). Patients should be aware that poor quality control is a major concern with commercial herbal products. Arctiin and arctigenin, the lignans present in burdock, exert anti-inflammatory effects by inhibit the pro-inflammatory factors, nitric oxide (NO), tumor necrosis factor-alpha (TNF-a), and interleukin-6 (IL-6) (3) (4). The polyacetylenes and chlorogenic acid have antibacterial properties and are thought responsible for burdock’s beneficial effects against infections and skin disorders (11). Arctigenin and arctiin, along with lignans matairesinol, (iso)lappaol A, lappaol C, and lappaol F were shown to up-regulate the expression of Jun-N-terminal kinase-1 (jnk-1), and promote longetivty and stress resistance in the round worm Caenorhabditis elegans via the JNK-1-DAF-16 cascade (15). Animal studies indicate that burdock extract induces hypoglycemia and increases carbohydrate tolerance, stimulates uterine smooth muscle, and has antimutagenic activity. The tannin extract induces macrophage response (8). Burdock also exhibits hepatoprotective effects in rats due to its antioxidative activity (6). Further, Lappaol F was shown to induce G(1) and G(2) cell-cycle arrest, induce cell death in several cancer cell lines, and to activate caspases (16). In other studies, arctigenin inhibited the proliferation, and induced caspase-3-dependent apoptosis of ovarian cancer cells via suppression of inducible nitric oxide synthase (iNOS)/nitric oxide (NO)/signal transducer and activator of transcription-3 (STAT3)/survivin signalling pathway (17). Patients allergic to chrysanthemums may exhibit cross-sensitivity to burdock. Burdock may cause uterine stimulation and should be avoided by pregnant women. Case Report: A 53-year-old man developed anaphylaxis (redness over his entire body and dyspnea) one hour after consuming boiled burdock. His symptoms resolved following treatment (10). Hypoglycemics: Theoretically, large doses of burdock may have an additive effect. Zhao F, Wang L, Liu K. In vitro anti-inflammatory effects of arctigenin, a lignan from Arctium lappa L., through inhibition on iNOS pathway. J Ethnopharmacol. 2009 Apr 21;122(3):457-62. Foster S, et al. Tyler’s Honest Herbal: A Sensible Guide to the Use of Herbs and Related Remedies. New York: Hawthorn Herbal Press; 1999. Knott A, Reuschlein K, Mielke H, et al. Natural Arctium lappa fruit extract improves the clinical signs of aging skin. J Cosmet Dermatol. 2008 Dec;7(4):281-9. Wang HY, Chen YP. Clinical observation on treatment of diabetic nephropathy with compound fructus arctii mixture. Zhongguo Zhong Xi Yi Jie He Za Zhi. 2004 Jul;24(7):589-92. Lin SC, et al. Hepatoprotective effects of Arctium lappa Linne on liver injuries induced by chronic ethanol consumption and potentiated by carbon tetrachloride. J Biomed Sci 2002 Sep-Oct;9(5):401-9. Bryson PD. Burdock root tea poisoning. Case report involving a commercial preparation. JAMA 1978;239:2157. Tamayo C, et al. The chemistry and biological activity of herbs used in Flor-essence herbal tonic and Essiac. Phytother Res 2000;14:1-14. Rodriguez P, Blanco J, Juste S, et al. Allergic contact dermatitis due to burdock (Arctium lappa). Contact Dermatitis 1995 Aug;33(2):134-5. Sasaki Y, Kimura Y, Tsunoda T, Tagami H. Anaphylaxis due to burdock. Int J Dermatol. 2003 Jun;42(6):472-3. Chan YS, Cheng LN, Wu JH, et al. A review of the pharmacological effects of Arctium lappa (burdock). Inflammopharmacology. 2011 Oct;19(5):245-54.
da Silva LM, Allemand A, Mendes DA, et al. Ethanolic extract of roots from Arctium lappa L. accelerates the healing of acetic acid-induced gastric ulcer in rats: Involvement of the antioxidant system. Food Chem Toxicol. 2013 Jan;51:179-87. Lu LC, Zhou W, Li ZH, et al. Effects of arctiin on streptozotocin-induced diabetic retinopathy in Sprague-Dawley rats. Planta Med. 2012 Aug;78(12):1317-23. Hirose M, Yamaguchi T, Lin C, et al. Effects of arctiin on PhIP-induced mammary, colon and pancreatic carcinogenesis in female Sprague-Dawley rats and MeIQx-induced hepatocarcinogenesis in male F344 rats. Cancer Lett. 2000 Jul 3;155(1):79-88. Su S, Wink M. Natural lignans from Arctium lappa as antiaging agents in Caenorhabditis elegans. Phytochemistry. 2015 Sep;117:340-50. Sun Q, Liu K, Shen X, et al. Lappaol F, a novel anticancer agent isolated from plant arctium Lappa L. Mol Cancer Ther. 2014 Jan;13(1):49-59. Huang K, Li LA, Meng YG, You YQ, Fu XY, Song L. Arctigenin promotes apoptosis in ovarian cancer cells via the iNOS/NO/STAT3/survivin signalling. Basic Clin Pharmacol Toxicol. 2014 Dec;115(6):507-11.